We’re thrilled to be performing as part of the Barbican’s Sound Unbound festival with the debut performances of our Vox Machina project combining choir and live electronics. We’re delighted to be returning to the Newbury Spring Festival with a concert at St Martin’s Church in East Woodhay. We’re excited to be performing at the Budleigh Festival for the first time. Join us for an evening of stunning choral music on the theme of love and nature. Programme and booking details tba. We are honoured to be performing at the unveiling of a new gravestone for the poet William Blake as part of a special ceremony arranged by The Blake Society. 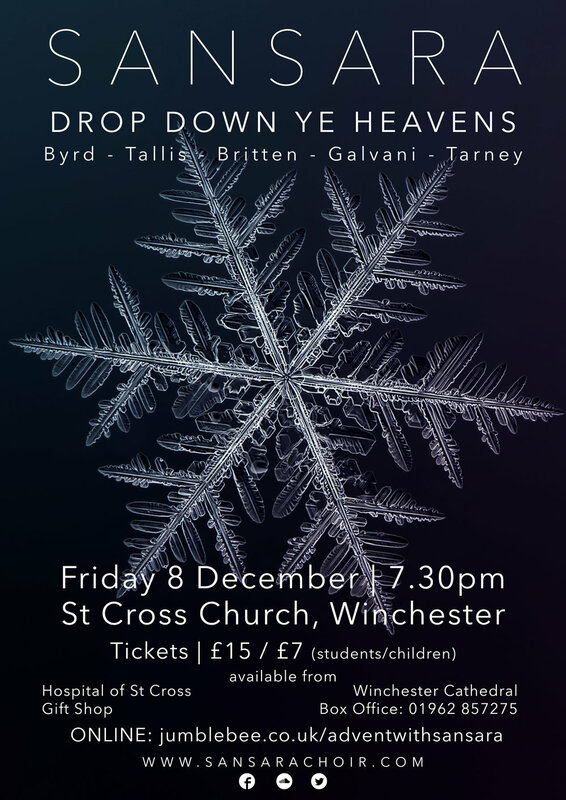 We will be performing a wonderful setting of a passage from Jerusalem by the composer Chris Williams. This is not a ticketed event and all are welcome. We're thrilled to return to Chirton for another early evening summer concert. Programme and ticket details tba. Join us for the launch of our Music of the Spires project in the stunning chapel at Pusey House. Tickets available here. Sansara Consort present choral music for Epiphany in the stunning Medieval Tapestry Gallery at the Victoria and Albert museum. Visit the website for information. We are excited to be returning to Winchester College Chapel to help raise funds for the NSPCC, hosted by Dame Esther Rantzen. For more information and to buy tickets, please visit the event page here. We are delighted to be back in Winchester for Christmas 2017. We will be presenting an Advent programme of choral masterpieces from the Renaissance alongside pieces from the 20th century and brand new compositions. Tickets available online here and at the St Cross Porters' Lodge (from 20 November). We are delighted to be returning to St John' Smith Square to take part in Place 2 Be's Carol Concert. The evening will feature readings from celebrity readers including Emma Thompson, Margaret Keys, Greg Wise and Patricia Hodge. For more information and to buy tickets, please visit the Place 2 Be website, here. We're excited to be returning to Oxford with Sansara Consort to perform our brand new Remembrance programme which juxtaposes of choral music from three masters of the renaissance with twentieth century compositions by Arvo Pärt and Sir John Tavener. In this way, we call to mind, with equal gravity, conflicts present and past; victims of war and terror, the plight of the refugees, and the fallen of bygone ages. Tickets available via Tickets Oxford (01865 305305). We're thrilled to be returning to Stockbridge with Sansara Consort to perform our brand new Remembrance programme which juxtaposes of choral music from three masters of the renaissance with twentieth century compositions by Arvo Pärt and Sir John Tavener. In this way, we call to mind, with equal gravity, conflicts present and past; victims of war and terror, the plight of the refugees, and the fallen of bygone ages. We are excited to be taking part in the 2017 International Choral Contest in the beautiful town of Tolosa in northern Spain. Watch this space for more details nearer the time! Sansara Consort present a programme of English and Italian madrigals in a lunchtime recital promoted by the Three Rivers Music Society. The previously billed concert at The Grange has unfortunately be cancelled. However, we are delighted to be performing with our Consort at The Blessed Mary church in Upham, Hampshire. There will be drinks available from 7pm at the church. The concert is free and there will be a retiring collection in support of Maggie's cancer support charity, raising funds for a new cancer care centre on the Southampton General Hospital campus. Please contact Sarah Le May (lemay@btinternet.com) for more information or to reserve seats. On Saturday 15 July, the Consort travel to Chirton to present a programme of English and Italian madrigals and partsongs. Click here for more information and to buy tickets.